Replica rear fender without tail lamp cut out has a raw finish. Uses late 1973-up large style tail lamp. We suggest pre fitting the fender prior to painting. Before priming or painting, fit the fender body, braces and mounting points in place. Fender rivets, hinge and brackets will have to be tweaked for final fitment. Patience is required for proper installation! 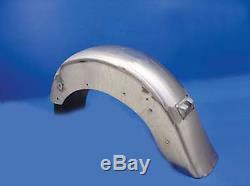 The item "Raw Steel Replacement Rear Fender 1979-1984 Harley FL FLH Shovelhead Big Twin" is in sale since Friday, October 10, 2014. This item is in the category "eBay Motors\Parts & Accessories\Motorcycle Parts\Body & Frame\Fenders".